There are many variations to Spring Rolls throughout the Far East, with differing wraps, some made from rice paper, as in the Vietnamese types, and gives a transparent appearance, or egg based wraps, similar to that of filo pastry. It goes with out saying, the fillings will also vary from region to region. 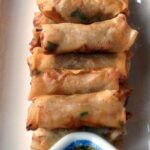 The Spring Rolls we are going to make today are often found in Chinese restaurants in Hong Kong, particularly in the Dim Sum eateries, and is often served with a dipping Worcestershire Sauce and or sweet chili sauce. First we will prepare all the vegetable items and place on a plate. Chop cilantro/ coriander, and Spring Onion / scallion shred (see picture) Cut it across into 1 inch lengths and then shred. Finely chop ginger and garlic. Now to prepare the meat. You need to cut it very fine like matchsticks. Watch the photos to get the idea. Place in a bowl and add the wine,cornstarch,chicken stock,water,sesame oil. Stir very well to get everything combined. Add 1 teaspoon Vegetable oil to a pan. Add mushrooms, ginger & garlic. fry until all soft. Add the pork. Stir fry until cooked. Transfer to your mixing bowl and allow to cool. Once the meat has cooled, add all the other ingredients together with the oyster sauce and combine very well. These wraps are a standard size so we need to cut them into quarters otherwise your spring rolls will be huge! Follow the pictures step by step and you will get the idea. You will need a little bowl of water to wet the sides so they stick. Work with 2 or 3 squares at a time. cover the rest with a damp tea towel. Put enough vegetable oil in a sauce pan, I prefer to fry 4-5 rolls at a time. When hot enough, add the rolls and cook until golden. Remove and drain on some kitchen paper, and serve with Worcestershire sauce or sweet chili sauce for dipping.